For a class of 30 students to perform simple Gram, acid-fast, endospore, and capsule stains. Requires the use of a microscope equipped with an oil-immersion lens. 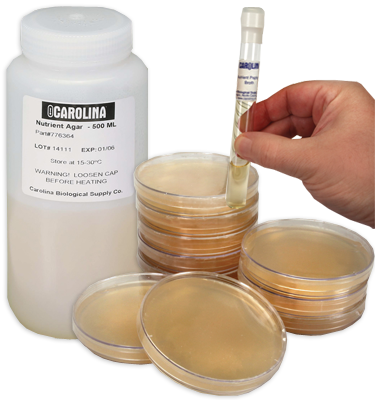 With teacher instructions and Carolina® booklet Techniques for Studying Bacteria and Fungi. Note: This item includes hazardous chemicals that will incur additional shipping charges. Miscellaneous - This product is/contains a DOT regulated hazardous material. Your order will incur a hazardous materials fee. Orders shipping to HI and AK are subject to review and may incur additional shipping charges. Also contains restricted bacteria, and cannot be shipped to high schools, preparatory schools, or individuals. This is a regulation of the Federal Health Service.